You get to a point in almost every series where the gang takes a road trip –and this is that book. All of the core characters are there: Kate, Curran, Derek… Andrea, Rafael, and even Saiman. So I didn’t feel like we were leaving much behind. 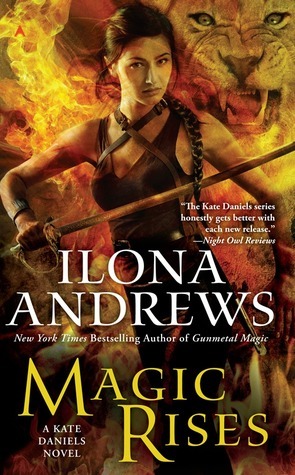 The basic conflict pits Kate and the gang against other shapeshifting factions and a surprise Big Bad, but for me, this book is more of an examination of the ties Kate has to her own Pack and whether they’ll stand against the external pressure. Basically, there are some European Packs who have access to a special blend of herbs that can stop a shifter from going loup. But they will only give it to Curran if he can protect a pregnant wolf princess long enough for her to deliver her babies. He knows it’s some kind of trap, but the reward is too great to pass up, so he loads up (most of) his best people and sets sail for the Black Sea. In the ever expanding Kate-verse, I was worried that all of the new characters would be overwhelming or confusing. They weren’t. I thought the plot was constructed very well, and though there were twists, turns, and surprises, I never found it cumbersome. The dialogue is snappy and funny. And ultimately, the story advances the overall series arc quite well. I say all this, but when you finish reading the book, the only thing you’ll be thinking about will be emotional roller coaster we go through with Kate and Curran. I’m always a bit wary of long running series with a single love interest. I worry that they’ll get boring; they’ll lose their spark and I’ll stop caring. That is most definitely not the case here. We’ve got Trouble (with a capital T.) And the thing is, despite everything these two have gone through to get together, the conflict is very real. It was hard to read at times, because I have grown to love Kate and it hurts to see her hurt. I’m not going to tell you what happens or how it all ends up, but I will say that I was riveted and –by the time it was all said and done– emotionally spent. Plus, there was a pretty significant death that I didn’t see coming. All in all, I thought it was pretty fabulous. And it has me really amped up for the confrontations that lie ahead. The next book can’t come soon enough. I’m so tempted to read the spoiler. But I won’t. This is definitely the gold standard for UF! I adore this series and I am amazed by the world building and how it impacts the story while in progress. Very, very clever! In addition to the world building, there is the, always-entertaining, mouth-watering relationship between Kate and Curran. This is one of their strongest books yet and the battle scenes awed me almost as much as the midnight games in Magic Strikes. They are building the story so nicely, with such careful precision, and I can hardly wait for the next book!